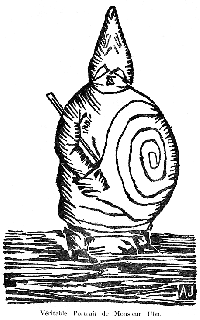 The grotesque potbelly of Monsieur Ubu. Bakhtin explained how the grotesque body is a celebration of the cycle of life: the grotesque body is a comic figure of profound ambivalence: its positive meaning is linked to birth and renewal and its negative meaning is linked to death and decay. 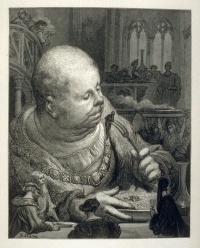 In Rabelais' epoch (1500–1800) "it was appropriate to ridicule the king and clergy, to use dung and urine to degrade; this was not to just mock, it was to unleash what Bakhtin saw as the people’s power, to renew and regenerate the entire social system. It was the power of the people’s festive-carnival, a way to turn the official spectacle inside-out and upside down, just for a while; long enough to make an impression on the participating official stratum. With the advent of modernity (science, technology, industrial revolution), the mechanistic overtook the organic, and the officialdom no longer came to join in festive-carnival. The bodily lower stratum of humor dualized from the upper stratum." The concept is still in use in the late 20th and early 21st centuries, in such works as Subversive Pleasures: Bakhtin, Cultural Criticism, and Film by Robert Stam. Unless indicated otherwise, the text in this article is either based on Wikipedia article "Grotesque body" or another language Wikipedia page thereof used under the terms of the GNU Free Documentation License; or on original research by Jahsonic and friends. See Art and Popular Culture's copyright notice. This page was last modified 06:29, 24 May 2014.